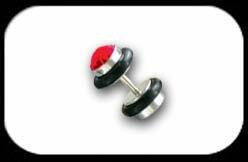 Fake Plug with a red jewel and 1.2mm shaft. Fake Plug giving the apperance of a large flesh plug. Plug end size option of 3mm, 6mm or 8mm.